We’re proud to have a Volunteer Services program that maintains the standards of excellence for which Rady Children’s is known. Volunteers play an important role in helping Rady Children’s give the best care to our patients and families. We know volunteering here can give you a wonderful sense of satisfaction. Due to our extensive training and dedication to quality, all hospital volunteers are asked to make a one-year commitment (100 hours) to volunteer within the Hospital. Click here for application information. 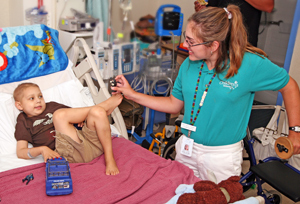 Below is a sampling of volunteer roles at Rady Children's Hospital. All roles are subject to current availability and areas of greatest need. Work with patients, families (including siblings) and staff in an effort to maintain normalcy for the hospitalized patient. Support is given primarily in the Play Room/Activity Rooms within a patient care area, including Critical Care, Hematology and Oncology, Medical and Surgical Units. Activities center around playing games, painting, coloring and other special projects. Volunteers need to be friendly, able to cope with serious illnesses and willing to spend time at the end of the shift cleaning and disinfecting toys in the playroom. Serve as a liaison between families and surgery staff to keep families apprised of the child’s status. Assist and monitor the waiting area while maintaining a pleasant and orderly atmosphere. Provide information about the Hospital environment and services to the families of those who will be inpatients. Assist in the Early Intervention Program for children with communication disorders, including speech, language and hearing impairments. Provide assistance within a group setting under direct supervision of staff. May assist in the preparation of materials for the individual and/or those in group therapy. Provide information and directions in a gracious and welcoming manner to all who enter Rady Children’s at the two main entrances. Perform various clerical functions within Hospital departments including filing, copying and computer data entry. Provide social interactions, happy conversations, read stories, play games, assist with arts and crafts activities and accompany children on special outings in the community. Volunteers may be requested to spend time at the end of the shift cleaning and disinfecting toys as needed. Provide diversionary play for the children, prepare teaching materials and maintain a safe, orderly environment. Activities occur in the classrooms or in the outdoor play area. Provide support services to staff in maintaining an optimal therapy and working environment.